Strengthening exercises, illustrated with unique lifelike figures. Training for the back, core, upper body and lower body. The routines of strengthening exercises below offer a balanced, challenging workout using minimal equipment. Practice the exercises with good form (as demonstrated in the illustrations) and you will improve your muscular control as you build strength. There are back, core, upper body, lower body workouts using bands, foam roll, stability ball and / or body weight. The difficulty level of the routines is from beginner to intermediate for the most part. 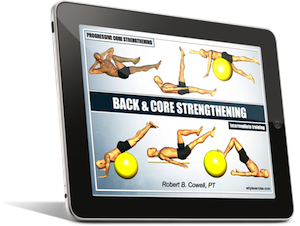 Advanced exercise routines are covered in my eBook, Progressive Core Strengthening. A good place to start with back and core training is my article on back strengthening exercises. This article shows you how to begin developing a strong, balanced midsection. The exercise routine trains all the deep muscle layers that support the spine, including all 4 abdominal muscle groups. The routine is covered in much more detail in my introduction to core strengthening. This e-book includes illustrations from multiple perspectives, exercise modifications, comparisons of correct and incorrect form, and an 8 week training program. Once you have a handle on these intro routines, you can try the next level of training with my articles on stability ball exercises and pilates sample exercises. 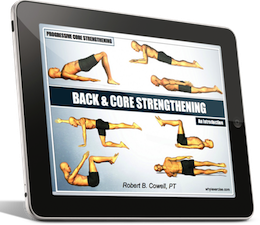 Between the 2 routines, you'll have a sampling of the training program in my intermediate core strengthening e-book. The routines in this e-book incorporate the stability ball, foam roll and several movement variations for a greater challenge to the core muscles. If you're looking for advanced training, see my complete guide to core exercise, Progressive Core Strengthening. There are 6 routines in the book, beginner to advanced in difficulty level. The book includes a corrective training method, illustrated with detailed anatomy diagrams, that teaches you how to protect your spine when you exercise. These routines offer introductory to intermediate level training for the shoulders, arms, hips and legs. 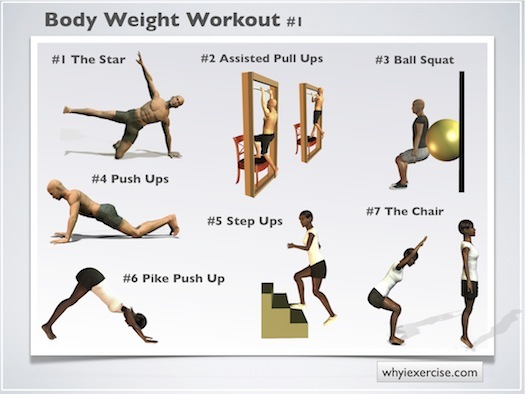 Two of the workouts include upper and lower body exercises in the same workout. The article on resistance band exercises combines dynamic shoulder and arm exercises with a static lunge position to build strength and challenge your balance. The article about body weight exercises includes a routine that builds functional strength and trains balance for your upper and lower body. No equipment needed. Most of the exercises are easily modified to make your workout easier or more challenging. These routines are also travel- friendly since they require very little exercise equipment. Each workout is about 15 minutes long. Try both routines together in the same workout! There is a third workout available that focuses on the lower body. My article about knee strengthening exercises includes a routine that targets thigh, hip, gluteus, and calf muscles. Being that these muscle groups work together to support and control the knee joint, this routine will help improve your balance and muscle tone while reducing your risk of injury. If you need exercise routines that are easier on your joints, see my article on physical therapy exercises. You'll find 4 additional strengthening routines to choose from. Return from illustrated strengthening exercises to exercise illustrations. Return to home page, whyiexercise.com.